If you are planning a romantic getaway or a family vacation 'An Island Escape' has just what you are looking for. This riverfront cottage overlooks the Southwest River. Here you are able to enjoy the panoramic views from any of the three decks, walks along the beach, a game of horseshoes, a swim in the salt water pool, or relax in the two person jacuzzi tub. 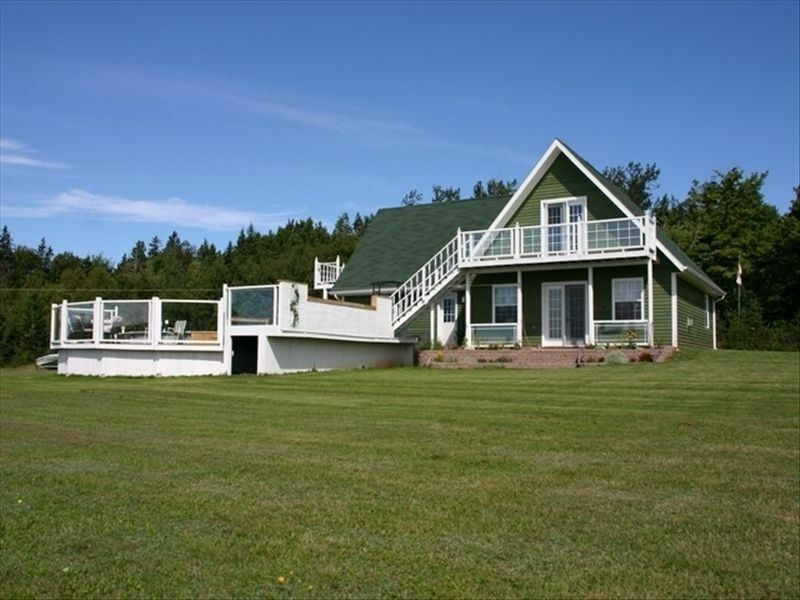 It is just minutes away from Burlington go-carts, Woodleigh Replicas, Cavendish Beach tourist area, golf courses, restaurants, shopping, Thunder Cove Beach and Cabot Beach. It is perfectly located for day trips anywhere. A spacious bedroom with a walk in closet is located on the main floor with a queen size bed. Upstairs has two bedrooms; one with a queen bed while the other comes equipped with bunk beds (futon on bottom) and a double bed. In addition, there is a cot available for extra members of your crew. On the main floor the bathroom has a two person Jacuzzi tub as well as a stand up shower. Upstairs there is a half bath. The kitchen downstairs comes fully equipped with all the amenities you might need. Or barbecue on the deck while watching an unforgettable sunset. If the weather keeps you inside there is still lots to do; sit by the propane fireplace and curl up with a good book or sit back and enjoy the television equipped with satellite and a VCR/DVD player. Please view video under links and video. Rates are from $1800 to $2,400. During the summer months the cottage is only rented on a weekly basis (Saturday to Saturday). During the off season a minimum rental of 3 nights is required. To confirm your week, a 50 percent deposit is required at time of booking. The other 50 percent is due at check in. This can be paid in form of E-transfer, cheque or cash. Rates are from $1800 to $2,400. During the summer months the cottage is only rented on a weekly basis (Saturday to Saturday). During the off season a minimum rental of 3 nights is required. To confirm your week, a 50 percent deposit is required at time of booking. The other 50 percent is due at check in. This can be paid in form of E-transfer, cheque or cash.